Horn of Balance is Martijn's personal project. It is currently ZFGC's featured project for the 1/1/13 period as it has shown great promise and Martijn has been putting a lot of work into it. Horn of Balance by Martijn is well-polished: the graphics are well-rendered, the text flows nicely, and just aesthetically looks great. Considering this game is still in development, it's understandable that there are still flaws. I was generally impressed when I opened the game and saw the intro screen and the presence of a UI. Of course, I didn't really know what the controls were, but that's not a big deal. I just had to tap some random keys for a while to figure out what did what. I did not play for long due to what feels like a bug, but from what I did play it's a pretty good fan-game. I kinda fell in an invisible hole...I'm not really sure it was supposed to be there. I fell into what seemed to be a dungeon and could not continue forward. Also, there are some obvious flaws with the text (grammatical issues) but that's a small detail. Otherwise, the game feels pretty good. The story for this game will be heavily based around the balance in the world, as the title might have given away. I'm reluctant to give too much away because discovering something for yourself (eventually) will always be more fun that just having it told, but I do realise that development will take several more years. 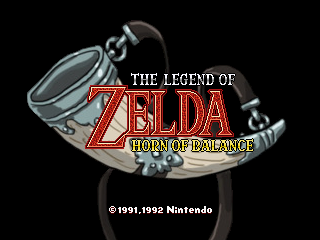 So I'll give a little of it up, namely what the horn of balance is and what its significance to the story is. Like I said, the theme for the game will be balance. To those of you who have been skilled enough to reach the end of dungeon one it will be no great surprise to learn that certain items in the world have the power to disrupt the balance of things. Think along the lines of storms becoming frequent through a weather icon. Or the land drying up after a treasure is removed from it's resting place. Through the game the world will little by little fall into ruin and it is up to the player to restore what has been disturbed. This is done with the help of the horn of balance. You see, the ruination of the world will not go unnoticed and eventually the great fairy mother (whom also resurrects you upon death) will beckon you to her. She feels the pains of the world and grants you the magical horn to sooth it. The item has two functions. It can absorb (evil) spirits (that are keeping the world out of balance) and output the essence of said spirits (as in: absorbing a water themed boss's spirit would somewhat relate to like learning the song of storms). 1. You mentioned that this project has been in development since 08 with some ups and downs. Can you comment on some of the obstacles you've hit? Well, I'm in the fifth year of development right now and my personal situation has definitely changed. Over the time interests have shifted. Relations have come and gone. I've moved across the country, found work and had the nature of that work change several type over. There are always other things going on at any given time, but the project is alive. It started as a fun little hobby and it actually still is, albeit with slower progress. I'm a little dis-heartend by the diminished community interest, but I guess that is to be expected with such a long cycle. This is mainly what that starting comment refers to although there have also been programming challenges too naturally. The game is being developed in gamemaker. I update the coding to new gamemaker release (currently 8.1), but aside from that I make it a point to not use anything else like .dll's. It may sound a little silly, but don't want to become dependant on programs that may not work anymore if gamemaker gets updated. Maybe I'll code my own .dll's in the future, but I'm good for now. Sometimes people suggest switching over to a different language, but that really shows a lack of understanding of the complexity of what's already present. And besides, working with just the tools that you are given is half the fun. 3. 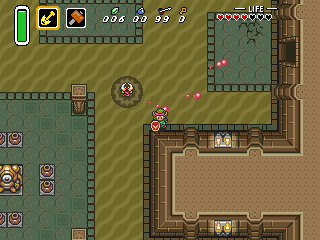 Seeing that this is a LttP sequel has probably sparked some curiosity in the community. 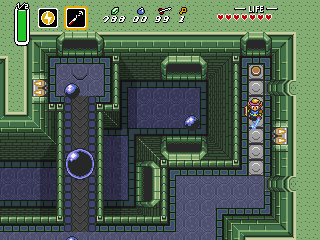 Could you give an example of the references you make to LttP in this game? 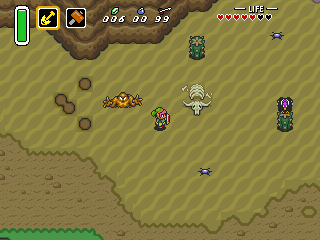 The game is only faintly related to alttp, but references will be included. 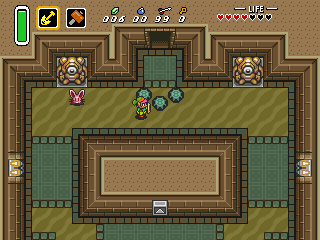 An example of this will be when Link's uncle tells Link of the legend of the golden land long ago in a different land. Ganon will be referenced as a type of boogieman for children and the Triforce is said to exist somewhere in the world. Certain small cameo's will also make an appearance, but aside from that the game will contain a fresh new cast. There will be a new bad guy, a new motivation to travel the world and (as I get further) more and more new gameplay mechanics. 4. It looks like your latest release was an NFCF demo. What kind of features can we expect to see in the next one? Like I mentioned earlier, interest in the project is not as high as it once was. So I'll base the next demo partly on the requests I'll receive. 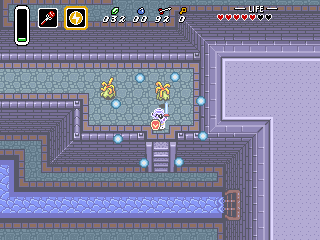 Personally though, I figure people have see enough of the first dungeon and want to play a new one right of the bat. That's what I'm currently working on in terms of new areas. 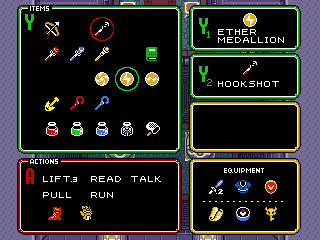 Gameplay wise I might included one or two more items and some more enemies. Actually, I really hope the bosses in dungeon 2 will come off as a fresh new concept. 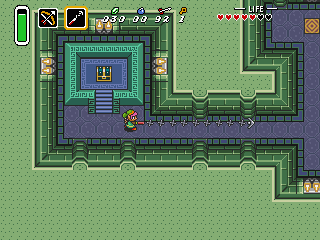 Can't spoil it just yet, but let's just say I'm trying to think outside of the box with the endboss (much like already tried to a lesser extent with endboss 1). If at all possible I also hope to include a darkness system in the next demo, but it'll be a real challenge. 5. Under your bosses, you've specified the boss Vanmol as "Last Remnant." What does this title refer to in relation to the boss' role in the story? What happened to the world to reach such a state will be explained somewhere between dungeon 3 and 4. This page was last modified on 2 January 2013, at 01:02.